Denmark, 2006, 120 minutes, Colour. Mads Mikkelson, Rolf Lassgard, Sidse Babett Knudsen. An Oscar nominee for Best Foreign Language film of 2006. 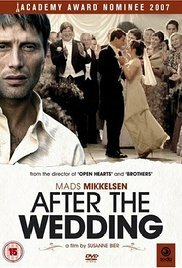 The opening is arresting as Jacob, Mads Mikkelsen (the junkie in the Pusher films and Le Chiffre clashing with James Bond in Casino Royale) is a dedicated and popular worker in an orphanage in Mumbai. The immediate emotional appeal is very clear. However, the plot proves less predictable than one might have thought. Jacob has to return to Denmark to consolidate funds for the orphans. His benefactor is a wealthy businessman who has built up his empire from nothing. Seeming rather indifferent to Jacob’s presentation and video of activity in Mumbai, he invites Jacob to his daughter’s wedding the next day. Here matters become very complicated and the storyline is best left for audiences to find out for themselves. Needless to say, Jacob has to fight for his projects but the industrialist has more hidden motives in mind. The material is more than a touch soap-operatic but rises above this through the powerful performances of the principal cast. There are domestic issues as well as questions about philanthropy, foreign do-gooding in countries like India and collaborating with Indians to effect their own development. 1. Critical praise for the film? Humanity? Complexities? Relationships? Europe? Volunteers for overseas Charity, sponsors? 2. The scenes in India, the streets, Mumbai, poverty, the orphans, needs? The woman in charge? Funding? European Foundations? 3. Scenes in Denmark, value society, business companies, wealth? The wedding as the focus? 4. Introduction to Jacob, his work, agent experience, easy rapport with the orphans, with a special boy? His service? His superior, the issue of money, the funding? his going to Denmark, not wanting to go, leaving the boy behind? The revelations about his past, drinking and drugs, the relationship with Helene, not knowing her pregnancy? 5. Jacob, in Denmark, going to the office, in his suit, the documents, presenting his case? Jorg listening, cutting him off? His invitation to the wedding? Being escorted to the office by the groom and their discussion? 6. The family preparations, the daughter, her fiance, love, the role of the parents, tension between mother and daughter, the ceremony – in view of the later behaviour of the groom? 7. Jacob coming to the ceremony, Helene looking and being puzzled, tensions, the reception, the bride and her speech, the groom and his toast, praise of the stepfather? Jacob becoming aware of the reality, discussions with Helene, the truth? The guest flirting with him – and the information about the daughter being a spoiled girl and her later episode with the groom? 9. Jorg, his illness, keeping it secret, the doctors, his collapse, Helene knowing, the daughter and her response, Jacob and the effect of this news on his attitude and decisions? 10. The daughter, learning, reactions, a relationship with her mother, the clash, coping? Her responding to Jacob, meeting with him, discussions? 11. Jorg and his family, the boys, going fishing, the discussions about the fund, the prospects? 12. Jacob, phoning India, the superior and happy about the money, the boy and his disappointment? 13. The pressures on Jacob, his past, redemption, having a daughter, the relationship with Helene? Jorg and his death? His will? Jacob returning to Indian India, and the boy deciding to stay? 14. A humane drama and its complex issues?